Tom Thomson, on the day he died, had no clue that he would in the next few decades become a national legend and the premier artist of his country. Or that his modest body of work would help redefine Canada's identity, in the process transforming the national self-image from a polite and subservient British colony, to an independent country proud of its wilderness landscape and pioneer past. Thomson's haphazard move brought him to the right place, a stimulating city where he could find employment, enjoy a lively if relatively staid bohemian culture, and form a circle of friends and mentors who would help him transform, in a few short years, from a beginning commercial artist to a working fine artist. Thomson also learned from his work as a commercial illustrator, and this day job invested his painting (as it would Winslow Homer's and Edward Hopper's) with decisive composition, clear lights and darks, and assertive color. Some artists find a special place that becomes inseparable from their work, that supplies inspiration, subjects, and purpose to their painting. For Thomson, that place was Algonquin Park, an enormous tract of forests and lakes only a hundred and twenty miles north of Toronto, but a world apart. Preserved by the government as a recreational sanctuary, the park held grand hotels and tourist sportsmen, but also two thousand square miles of wilderness. Thomson began living in rhythm with the seasons: spring, summer, and fall, he painted, fished and explored the park. When winter came, he returned to his tiny Toronto studio, working up sketches into larger format landscapes, to try to sell in Toronto. A canoe is the natural way to travel this watery landscape, and Thomson taught himself to paddle and portage. He carried along a home-made pochade box. Wooden panels of a standard 8 1/2" by 11 1/2" size were slotted into the top, and the box served as both palette and carrier. It's easy to imagine Thomson, a solitary figure on the water, bobbing slowly in his canoe while painting as fast as he could to keep up with the changing colors of a transient sky. When landscape painters work outside, we are often (if not always) painting man's affect on nature. Could an artist find in today's world a forest that hasn't been logged, a sky that hasn't been altered in color by pollution, or even a glacier whose shape has not been changed by melting? In 1914, while Thomson was trying to capture what he saw and felt in the Canadian woods, the world was sliding like a log in a chute towards the catastrophe of World War I. If it hadn't been for an inability to pass the army physical, Thomson would have joined his artist friends and enlisted. The irony is that they survived the killing fields of Europe, and Tom Thomson stayed home in Canada, and drowned. In Tom Thomson's memory, they continued to explore their country's landscape, formed into the Group of Seven, and eventually became the first Canadian art movement. The Group of Seven went on to follow Thomson's path away from city studios, and towards the small towns and forests of Ontario, Quebec, and British Columbia. Other artists surpassed Tom Thomson in technical skill and aesthetic theory, have been more refined, or prolific, or ambitious. But I can't think of many who painted their own private landscape with more urgency, honesty, or feeling. Thomson's love of the Canadian wilds impelled him to paint, and his paintings, with their passion and discipline, perfectly embody that love. Yet, next to the beauty of nature, he thought his sketches were worth little more than the intensity of his experience while painting them. 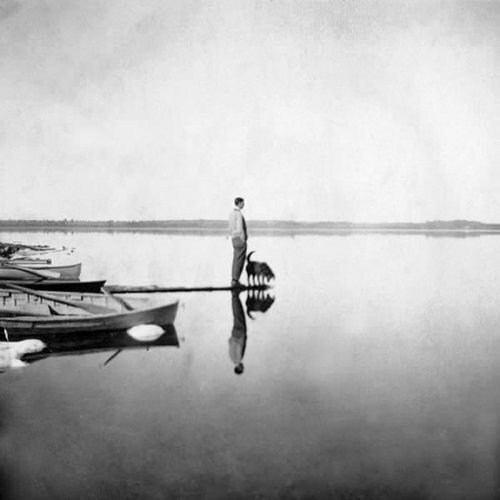 On the grey and drizzly morning of July 18th, 1917, Tom Thomson paddled out from the shore of Canoe Lake in Algonquin Park, Ontario, and disappeared forever. He was one month shy of his 40th birthday, an avid fisherman, part-time park ranger, commercial artist, and, for the last five years of his life, a landscape painter. Tom Thomson is an unlikely mythic hero. He was born near Toronto into a large family who worked hard on their farm, hunted and fished, read the Bible and poetry in the evenings, and played music together--all activities that would form his lifelong interests. When the time came to leave his rural home, Thomson floundered. He apprenticed to a machine shop, then tried business school, next moved to Seattle for a year, then left the U.S. abruptly after an unfortunate love affair. Finally Thomson returned to Toronto, where, after settling down in a boarding house, he began training as an illustrator. Thomson was taught his painting craft by these artist friends, and by trial and error. He always regretted his lack of formal education, but compensated by constant reading and steady drawing practice. From his artist peers who had the advantage of European travel, he learned of Impressionism's exciting new palette of intense hues, of Constable's obsessively studied skies, and Turner's passionate sketches from nature. Exhibits of Scandinavian painting, with their subjects of dark forests and dramatic skies, showed Thomson the power of his own northern landscape. Through his reading of Emerson and Thoreau, and tramps alone in the woods near the city, he absorbed the spiritual power of nature. Thanks to the support of artist friends and wealthy mentors--a circle of men who provided a studio, arranged shows, paid stipends, fostered his abilities, and treasured his friendship--Thomson began, at the late age of 35, to believe he could be a painter. Thomson immediately felt at home in his small corner of this immense space. He spent the summer of 1913 painting there, and returned to the city determined to quit his illustration job and become a full-time painter. In Algonquin Park, Thomson had found his personal, Canadian landscape, with its motifs of white birches and black pines, jagged shores, dramatic light, and theatrical seasons. Judging by the many small symphonies Thomson painted in the key of cadmium, with their vivid notes of yellow, orange and red, autumn was his favorite time of year. Thomson's compositions often feature what we would see if we were sitting in the low bench of a boat near the shore of a lake: a close view of water in the foreground, the dark horizontal zone of a distant shore, an active colorful sky. There are no details in these quick studies, but we can feel the weather, and know the time of day. Already at the turn of the century, Thomson found an Ontario "wilderness" affected by industry, crisscrossed by roads and flumes, with acres of clear cutting, dammed rivers, abandoned logging camps and fire-swept hillsides. Thomson was both repelled and attracted to these human intrusions on pure nature, and, like many artists since, found the mess man makes of God's handiwork painful to experience, but often very interesting to paint. These friends, who had loved Thomson for his physical grace and generosity, who supported him through his dark moods and insecurities, who taught him to paint, and were finally surpassed by him as an artist, were devastated by his inexplicable death. Tom Thomson led the way, but he's also one of those rare painters who stands apart from groups and movements. In his brief five years of mature painting, he discovered his true subject, and developed a unique approach. Thomson synthesized intense color, expressive brushwork, deliberate design, and acute observation of nature into work that was, finally, only his own. Today Thomson's little oils are as valuable as icons, though he's famous in Canada more for his mysterious death than for his work. In the United States, Thomson is largely unknown, except among that tiny subset of the population who care about landscape painting. For many of us, Thomson is in that select pantheon of Painter's Painter, someone to learn from, and to love. Your comments are welcome below! Feel free to leave your name and website address.